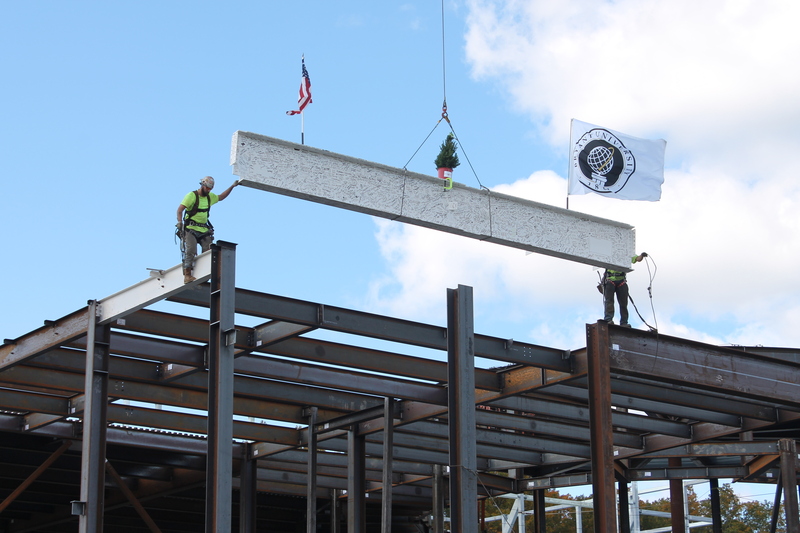 (Boston, MA) – BOND, the Northeast’s premier full-service construction management and general contracting company, recently celebrated a topping off ceremony for Bryant University’s new Academic Innovation Center, a two-story, 50,000 square-foot building that will serve as a welcoming focal point for the Smithfield, R.I. institution. Part of Bryant’s capital improvements campaign to educate and cultivate future leaders, the Academic Innovation Center will foster a creative, immersive learning environment aligned with the University’s strategic plans to advance new models of innovative learning. Designed by Einhorn Yaffee Prescott (EYP), the building houses classroom and collaboration space for Bryant students in both the College of Business and the College of Arts and Sciences. The facility will also include a café and a 4,000 square-foot Innovation Forum. Slated for completion prior to the 2016 academic year, the Academic Innovation Center’s flexible learning environment will add particular value to Bryant’s nationally recognized “first-year experience program.” This unique portion of the University’s curriculum includes an innovation and design-thinking course for which the Center will serve as a home base. BOND is also at work on the expansion of Bryant’s Chace Wellness Center, which includes a two-story, 6,700 square-foot addition and 3,400 square-foot renovation along the east side of the existing Multipurpose Activities Center. Working closely with the design team at Sasaki Associates, BOND will expand a Training Room on the Center’s first floor and construct office space for the Athletics Administration and Bryant’s Division 1 Football program on the second floor. With these projects, BOND maintains its strong ongoing relationship with Bryant University, having recently completed a 33,000 square-foot renovation of the university’s Salmanson Dining Hall, which also included upgrades to the property’s kitchen, server, and adjacent office space. Bryant University in Smithfield, R.I. is a leading private university offering an innovative and uniquely integrated business and liberal arts education. The University’s groundbreaking academic programs have been nationally recognized by organizations including the Davis Educational Foundation and Hanover Research. Founded in 1863, Bryant University has approximately 3,700 graduate and undergraduate students from 32 states and 63 countries. Bryant University is recognized as a leader in international education and regularly receives top rankings from U.S. News and World Report, Bloomberg Businessweek, Forbes, and Barron’s. Visit www.Bryant.edu.